Do you even wrist-type, bro? You totally could with Minuum... I mean, not that you'd necessarily want to, but you'll have the option. 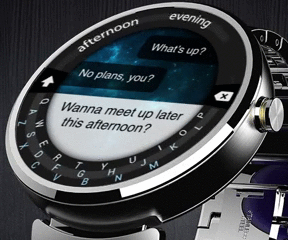 The maker of the compact Android keyboard has announced it's working on a version of Minuum for round Android Wear devices like the Moto 360. There's even a GIF demo. Minuum works by crunching all three rows of the standard QWERTY down to one line (an arc along the bottom here). You just tap in the general vicinity of the right letters, and Minuum figures it out. The Android app is, admittedly, pretty neat. The autocorrect can be a little bit spooky as it translates your sloppy taps into real words. It's not perfect, though. This idea makes more sense on a small screen than other keyboards, but is it really something you want to use? The developers have worked on porting Minuum to other wearables like the Gear, but it's not even clear at this point how Android Wear will work. Certainly voice input will be big, but will apps like Minuum work the way we envision? Doesn't matter – prepare for wrist typing in some form.